The DESMOPOL range of products is specially formulated for waterproofing all types of surfaces for new construction and rehabilitation purposes. DESMOPOL can be applied on both flat and inclined surfaces and its high resistance properties makes it ideal for regular pedestrian traffic. DESMOPOL is a completely watertight and continuous membrane, without joins or overlaps and 100% adherent to the surface. Application is simple and fast, producing excellent results. It can be applied manually, with a roller, squeegee, or air-less projection equipment. DESMOPOL is a hard wearing and resistant system ideal for areas of intensive use such as gardens, storage deposits, public municipal areas, damp zones of all types, etc. Rapid curing even in winter. Excellent adhesion to all kinds of surfaces. High resistance to extreme temperatures (between-40 ºC and + 80 ºC ). High resistance to abrasion and tension. The membrane is completely waterproof. Waterproofing roofing (flat, sloping) and patios (passable and not passable). Waterproofing of balconies and porches. Waterproofing of humid zones, under tile, as in baths. Waterproofing swimming pools, kitchens, etc. Protection of polyurethane foam for thermal insulation. To apply DESMOPOL the support must be a continuous surface without crevices or hollows in order to obtain the maximum adhesion of the continuous system of polyurethane. Also the support must be clean, dry and free of pollutants like dust, oil, grease, paint and other superficial treatments. When in doubt it is recommended that you realize tests on the substrate. The substrate should be consistent as our membranes have adhesion strengths of up to 1.85 N/mm2 (MPa). If you are not certain of the strength you should inspect the substrate and, where possible, carry out tests to determine the tensile strength. Please contact Tecnopol Sistemas technical department if you have any queries about other types of substrate (fiber cement, wood, asphalt, ...). The primer loses its properties 24 hours after application and, therefore, a minimum layer must be reapplied. This kind of reapplication is also necessary following rain. DESMOPOL can be applied using a spray machine capable of producing a pressure of 280 bar (4,000 psi) or by hand, using a brush or a roller and a rubber rake. In both cases application must be consistent. * In the case of low environmental temperatures, use DESMOPOL ACCELERADOR. 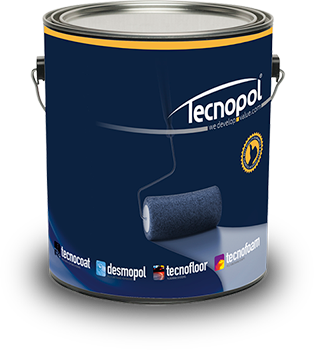 ** If you want to apply a second coat of DESMOPOL and more than 48 hours (24h with DESMOPOL ACELERADOR) have elapsed since the first coat of DESMOPOL was applied, the surface should be sanded and cleaned, and a primer coat of PRIMER EPW-1070 applied. After the DESMOPOL membrane has been applied a protective coat of TECNOTOP aliphatic polyurethane varnish (see table b) should be applied within 48 hours (24h with DESMOPOL ACELERADOR), to ensure the stability of the desired colour when there is no additional protection. TECNOTOP is also good for surfaces with heavy vehicle traffic, and essential for non-slip finishes and waterproofing of swimming pools, fountains, water tanks, aquariums, etc. “European Technical Approval” means a favourable technical assessment of the fitness of a product for an intended use, based on the fulfilment of the essential requirements of the construction work for which the product is to be used. DESMOPOL has an ETA certificate. It is a liquid based pure polyurethane elastomer that produces a continuous, flexible and completely impermeable membrane. On any type of flat surface without voids or cracks with prior conditioning of the surface to obtain the maximum adhesion of the system. As a continuous membrane, it provides a versatility of adapting to any irregular surface, even if curved or squared. Desmopol can be applied with an airless projection machine or with a roller. Yes, simply bear in mind the preparation of the surfaces, cleaning them of dust, oils or grease to be able to apply Desmopol correctly. The system Desmopol does not create joints as it is applied direct to the support, to the perimeter parapets, or to the singular points such as drains, corners or finished surfaces. Being a completely adherent membrane, it does not create interior air pockets. In these areas of parapets or points of water collection in drains, it is advisable to use a geotextile mesh casing. It appears in a colors variety such as gray, brick-red, white or transparent. Although if it is preferred it is possible to apply aliphatic varnish specific with a wide scale of colors RAL on the surface. Desmopol has a process of stability and drying of 8 hours approximately after application. Although this time can change perceptibly according to the grade of exterior environmental temperature (pg. 9 of the Desmopol catalog). Desmopol failure is scarce, although in case of escape of moisture due to a mistake in the application of the waterproofing, or a break after application, since it is a completely adherent membrane to the support, the origin of the water, coincides with the area of the break, the location of this point is direct and therefore, it diminishes or limits to the minimum the repair work necessary. From support temperatures of 5ºC up to 35ºC the previous priming Tecnocoat Primer-PU can be applied. The relative humidity has to be less than 85%. With Desmopol you can waterproof walls of concrete, deposits, cisterns or swimming pools with finished painting to be chosen. It is a product with a traction resistance of 55 N/mm2. Yes, it is very advisable in rehabilitations of patios or roofs, passable or impassable, where the difficulty of work or the excess weight of the existing structure are two factors to be kept in mind. Desmopol has the DITE 10/0121 certificate from theInstitute Eduardo Torroja with a useful life of 25 years.